Psychological operations and the end result of these operations are little known to most of humanity. Those that conduct the operations don't announce what they are doing in the same way a magician never gives away his secrets. Understanding the principle of secrecy and how important it is to magicians is all you need to understand the culture of secrecy among the ranks of the controlling class. One of the tricks to understanding how to stay sane in an insane world is understanding the process of how the world works. Now more than ever it is important to distinguish between truth and lies, what is factually happening versus how different people interpret or spin those events. It is important to separate emotional feeling from pure knowledge and facts. And it is important to realize the truth that is right in front of you regardless of how painful the truth may seem. Look the pain (that comes with truth) in the eye and see it for what it is. Once you do this, you will realize the hardest part is over with. Just getting you to see what is actually happening is indeed the hardest part. The control system knows this. They know that most people prefer not to look, they prefer to live in a dream world where government is the good guys here to keep you safe. People prefer to live in a world where everything is predictable, where everything is comfortable, and a world where fun and entertainment is the only thing that matters. This pacification of the masses is well documented by Sigmund Freud's nephew and so called founding father of modern day public relations Edward Bernays. Bernays was very vocal about how the engineering of consent would be done and why. He honestly felt that the general public could not be trusted to guide the zeitgeist of their current generation. Imagine, Bernays made a decision on behalf of all of humanity to instruct government on the engineering process and to misguide humanity's consciousness to suit the needs of a few controllers, all for the sake of humanity and to supposedly save humanity from its own inadequacies. Bernays even argued that this was the best thing for humanity. Today we are seeing all of Bernay's tactics being displayed. The engineering of consent to invade Iraq and now Syria illegally based on the series of carefully chosen over-sensationalized ISIS beheading stories. ISIS is now a full creation of the western mainstream media, CIA, Mossad and Allies. It's taken on a life of its own in the consciousness of humanity. You can feel humanity still buzzing over this brand new terror prospect. As in sports, when a new rookie phenom comes on the scene. The rookie impresses the consciousness of that sport and often for many years to come. After all, it's not every day that we wake up over thirteen years since the start of the war on terror, and find that a brand new terror boogie monster created itself in this almost post-terrorism era. Sounds surreal and unbelievable? Think there is no way any of this could happen unless Intelligence made it happen? Apparently many people in Iraq are not buying the ISIS psyop either. This compelled the New York Times to recently accuse the Iraqi general public of "conspiracy theories" for suspecting that ISIS and CIA are actually working together. Amazing isn't it? Remember when "conspiracy theorists" were supposed to be lonely paranoid geeks living in basements in America? As I've been predicting for years, now everyone will eventually be accused of being a "conspiracy theorist" as long as humanity continues to wake up to the globalist plans. If anyone hasn't figured it out yet, the words "conspiracy theorists" (as I have written about before) is reserved for those who try to expose the new world order plans. Apparently only the globalists are allowed to expose the same new world order we all expose every day. When they do it, it's normal. When someone else blows the whistle or reports their progress, it's "conspiracies". Even Russia's Putin has been accused earlier this year of "conspiracy theories" with regard to the Ukrainian Kiev government caught shooting down MH17. Another example of how anyone who opposes the U.S. Empire and the Zionist globalists is accused of being a "conspiracy theorist" across the board. Look for this pattern and question it. Despite all the war rhetoric from the usual politicians and mainstream media, there seems to be a feeling deep in the heart of many (as we're seeing in Iraq) that people are just not buying into this. Even if they are going along with mainstream media news and not outwardly questioning the ISIS stories. People are getting it. People are seeing the now clear pattern. People are looking at the Al Qaeda years, how the fake WMD accusations in Iraq and how 9/11 as a whole was used to get us into the "war on terror" which clearly now seems like it will never end which is perfectly aligned with "Rebuilding America's Defenses"- the paper written by the Bush Neocons as part of their Project for a New American Century stated long term plans. 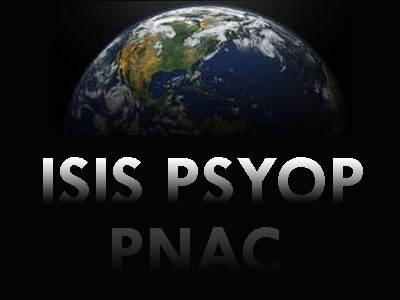 The ISIS psyop narrative is powerful and brings many other factors into play. For one, it has left the susceptible sector of humanity (hypnotized and believing mainstream media news) in a state of fear. This buzz has those in this sector living more on edge than ever before. They are quietly looking for ISIS and hoping government will "save" them from ISIS so that they don't end up like the "beheaded Christians" in Iraq. Those that are awake are also buzzing from the aftermath of the ISIS psyop wondering what the globalist will do next. Are they setting us up for another 9/11. We are all wondering how evil and how desperate they are. What will they do next? This buzz of anticipation is also contributing to humanity's awakening. With so much of humanity wondering, questioning, and doubting the ISIS narrative and admiring how nicely the ISIS psyop fits into the globalist long term plans, the ISIS psyop (despite those that are falling for it) is slowly becoming a huge window for people to wake up to the plans of the globalist. Remember, big false flags and big government psychological operations yield big results. They (the control system) don't draft out and carry out these plans hoping they win, they carry these plans out knowing they will win... or should we say, 'thinking' they will win. Of course, we (humanity) have a chance to change the outcome of this story by confronting the surreal ironies involved in the mysterious creation and full arming and funding of ISIS in a post terrorism era long after the start of George Bush's war on terror was launched. Remember how Bush told us his war on terror was going to squash terrorism? How did ISIS outsmart the U.S. empire and the entire NATO and global community whose primary focus is stopping terrorism? So in the aftermath of ISIS and before too many countries start sounding like Iraq and continue questioning who ISIS works for, the U.S. politicians went to quick work to vote for funding the terrorists and giving arms to them. The attitude among the corrupt politicians is: "we've seen the mainstream media stories about ISIS, we believe it so let's bomb." And with that they are agreeing to fund more terrorists and insurgent, wage more war and bomb more "targets". The engineered consent of the general public to go to war however, didn't actually happen the way we would have expected. Although the media presented their ISIS propaganda to spread the fear first, ultimately the consent was engineered alright, but mostly among the politicians. They don't care as much what the public actually thinks. They only care to generate scripted narratives. Narratives that they can spin on TV and verbally use as the pretext to the next war. Face it, they've got the war pretext dialogue mastered and it works for them every time. Every time that is, because we allow it. What can we learn from the ISIS crisis? We can learn from the subtle chronological sequence of events that Intelligence uses to introduce a crisis of Intelligence. Recall prior to the ISIS psyop we saw CNN's Jake Tapper covering the Ferguson shooting protest with a huge ISIS psyop banner strategically placed directly behind him. Keep in mind this was during the very early phase of the ISIS psyop. We also want to learn from the timetable we observed. Within just two weeks the mainstream media- government team worked up the ISIS scare to a maximum and spun the narrative so as to induce the brainwashed sheep into a trance where they expect the U.S. (Obama) to do something about the beheading videos. It was amazing to observe the speed and the systematic process by which the control system staged the engineered consent. Frankly, the entire process was predictable and frightening to anyone paying attention. Let us take this new knowledge of how the control system implements its engineered consent on the hypnotized masses, how and when the narrative gets handed over to the control system for its ready and waiting PRE-engineered consent. The sooner we all see the pattern the sooner we can come together to find creative ways to bring this all to an end. I believe there are creative ways to bring this whole suffering and madness to an end. For now lets keep sharing the truth about what the globalist are doing and let's just use their own template against them. Let's show them that repeating their own template for waging war and undermining sovereign nations is predictable and bound to eventually fail. Let's see to it that they fail at their plans for global control. Let's have fun (if you would) sabotaging their plans. Life is a journey, but you don't know exactly how the journey will play out. Stick to the side of truth and let the chips fall where they may. Fight for the bigger cause and let go your smaller paradigm. Let go the paradigm the control system wants to keep you in. The paradigm of self absorbance. This was the paradigm Edward Bernays understood was key to controlling the masses. Fight back, don't concern yourself with only your own SELF pleasures and egoism. Instead concern yourself with the bigger picture (NON-self) and DON'T allow the TV and media to control what you think. Try to see how opposing this modern day mind control mechanism is the coolest thing you can do. See how it is much cooler to BE the change, to master your own life and to not be a slave to the control system. Seeing reality for what it is will always be the first step. With the full commitment to the ISIS psyop the control system now needs to confront humanity as a whole (as indicated by the Iraqi people not being fooled). As we move forward I believe humanity is buzzing. That is people are talking, wondering, thinking, and observing more than ever. This is where we need to be before we can experience mass awakening.